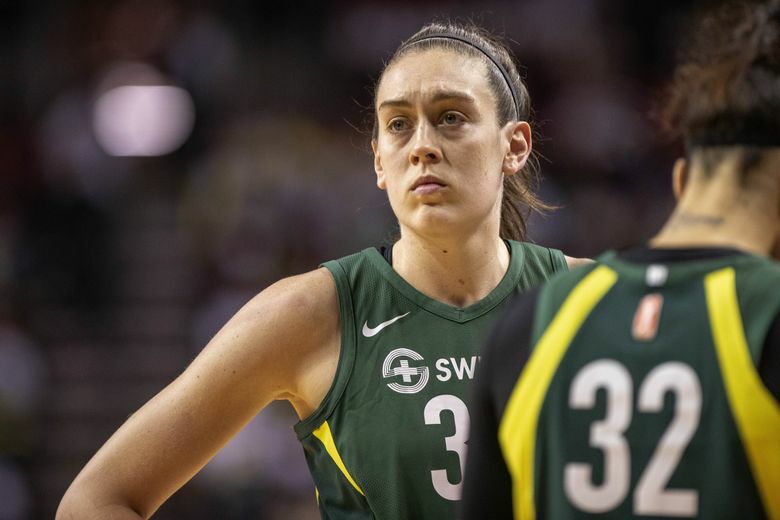 Storm star Breanna Stewart is expected to undergo surgery this week in Los Angeles to repair an injured Achilles tendon, her father Brian Stewart told Syracuse.com on Monday. The recovery from a torn Achilles tendon typically ranges from 6-12 months, which means the WNBA’s reigning most valuable player will most likely miss the upcoming season. Storm officials had no comment on Stewart who to LA on Monday for medical examinations. It’s believed the team is trying to determine the severity of the injury before discussing recovery plans. Stewart suffered the injury Sunday while playing for her Russian team Dynamo Kursk in the EuroLeague Final Four championship. She left the game late in the second quarter and did not return after going up for a jumper and landing awkwardly on opposing player Brittney Griner. The Storm star immediately grabbed her right Achilles while grimacing in pain before being helped off the court by team trainers. Storm second-year guard Jordin Canada tweeted: “Prayers up @breannastewart,” which included a heart and prayer emoji. Losing Stewart is a potentially crippling blow for the Storm, which is seeking its fourth WNBA title and attempts to become the third team to win back-to-back championships. The 6-foot-4 forward, who averaged a career-best 21.8 points, 8.4 rebounds, 2.5 assists, 1.4 blocks and 1.3 steals in 2018, is the centerpiece of a Seattle team that posted a league-best 26-8 record last season. Stewart also dominated in the postseason while averaging 24.6 points, 6.8 rebounds and 2.5 assists for the Storm, which swept the Washington Mystics 3-0 for the title and claimed its first championship since 2010. Stewart became the sixth person to win the WNBA Finals MVP and regular season MVP in the same year. The loss of the 24-year-old two-time WNBA All-Star, who was the No. 1 overall draft pick in 2016, would create a gaping hole on a Storm team that relies heavily on her all-around brilliance. Stewart had been incredibly durable while missing just one game in her previous three seasons with the Storm. During her four-year career at Connecticut, which included four NCAA tournament titles, she played in 152 of 156 games. This is the first significant injury for Stewart who tweaked her right knee in January 2017 while playing for Shanghai in the Chinese basketball league. Back then a sprained posterior cruciate ligament forced her to rehab for a couple of months and miss the Storm’s 2017 exhibition opener. This time, Stewart’s season-long absence is a tremendous burden on a Seattle team that includes All-Star guards Sue Bird and Jewell Loyd. In theory, Seattle could replace Stewart with 12-year veteran Crystal Langhorne, a 6-2 forward who started four years with the Storm before moving to the bench last season. The Storm will also need more from 6-4 forward Natasha Howard, who averaged 13.2 points and 6.4 rebounds – both career highs – in 2018 during her first year with Seattle. Seattle selected Ezi Magbegor, a 6-4 forward, with the No. 12 pick in last week’s WNBA draft. However, the 19-year-old Australian is expected to join the Storm next year. Stewart’s injury will be felt around the WNBA that will be missing Minnesota Lynx star Maya Moore, who is sitting out the year due to personal reasons, and Dallas Wings standout Skylar Diggins-Smith, who is pregnant and expected to miss most of the season. It’s also uncertain if All-Star center Liz Cambage, who requested a trade from Dallas, will return to the WNBA after leading the league in scoring last season with 23.0 points per game. The best-case-scenario for Stewart is she returns next year for the Storm and plays with Team USA in the 2020 Summer Olympics in Tokyo. She led USA to a FIBA World Cup title in December while capturing MVP honors. Former WNBA star Tamika Catchings had surgery on her Achilles in September 2007. The next year she played 25 games for the Indiana Fever and garnered a spot on USA’s gold-medial team in the 2008 Olympics. Stewart’s injury also brings new attention to the nearly two-thirds of WNBA players who play overseas during the offseason to supplement their incomes. The year-round grind can potentially take a taxing toll on players’ bodies. “I’m sure it’s a contributing factor,” Brian Stewart said. “The odds are going to go up that something’s going to happen the more you play, obviously. Whether this would have happened or not, I don’t know. It’s kind of a freak injury. I initially thought it was her ACL. Now I’m kind of wishing it was. Stewart, who was recently named the EuroLeague MVP, averaged 20.9 points and 8.6 rebounds for Dynamo Kursk. According to High Post Hoops, the Storm star is in the final year of a four-year rookie contract that will pay her $64,538 this season. The maximum WNBA salary is $117,500 while foreign teams reportedly pay top players hundreds of thousands of dollars. In 2015, Phoenix star Diana Taurasi sat out the 2015 WNBA season to earn $1.5 million from Russia’s UMMC Ekaterinburg. “The overseas experience is just different,” Stewart once told Syracuse.com. “It’s a different environment and experience compared to the United States, but the basketball is the same. The appreciation for basketball is the same, it might be better.